Antlers are the fastest growing tissue in any mammal, and a big bull moose can grow an 80-pound rack in a summer, adding a pound of bone and an inch a day. Known as moose across North America, but called elk in Europe, Alces alces is the largest member of the deer family. The Alaska-Yukon race (Alces alces gigas) is the largest of all of these creatures. Adult moose can range in size from 800 pounds (small adult female) to1,600 pounds (large adult male), and they can be up to almost 6 feet tall. Moose can range in color from golden brown to almost black, depending on the season and the age of the animal. Newborn calves have a red-brown coat that fades to a light rust color within a few weeks. By late summer, the calves have shed this coat and grown one that is similar in texture and color to that of adults. Moose are often easily recognized by their antlers, carried only by the males. These bony protrusions form within the first year, and are produced every summer after that. Trophy class bulls are found throughout Alaska, but the largest come from the western portion of the state. The largest sized antlers are usually produced when bulls are 10 - 12 years old, but bulls can reach trophy size as young as 6 years of age. In the wild, moose rarely live more than 16 years. Growth patterns, age at sexual maturity, and production of offspring are closely tied to range conditions. A female moose, or “cow,” typically breeds at about 28 months, although breeding has been known to occur as early as 16 months. After a gestation period of about 230 days, cows give birth to calves in the spring. At the time of birth, these babies can weigh in at a mere 28 pounds, but within the first 5 months, calves grow to about 10 times that size. Calves are generally weaned in the fall at the time the mother is breeding again, and they are chased off just before she gives birth in the spring. Adult males engage in the “rut” in late September and early October. During the rut, the males joust by bringing their antlers together and pushing. Serious battles are rare, with most injuries being minor. Occasionally, however, some individuals die from their wounds. The winner typically mates with several females. During the fall and winter, moose consume large quantities of willow, birch, and aspen twigs. In some areas, moose actually establish a “hedge” or browse line 6-8 feet above the ground. In the spring, moose also graze, in addition to browsing. During the summer, moose feed on forbs, vegetation in shallow ponds, and the leaves of birch, willow and aspen. Moose can generally be found all across the northern forests of North America, Europe, and Russia. In Alaska, moose live in a large area ranging from the Stikine River in Southeast Alaska all the way to the Colville River on the Arctic Slope. They are especially abundant on timberline plateaus; along the major rivers of Southcentral and Interior Alaska; and in recently burned areas that have generated dense stands of willow, aspen, and birch shrubs. Most moose make seasonal movements to calving, rutting, and wintering areas. They travel anywhere from only a few miles to as many as 60 miles during these transitions. About 175,000 to 200,000 moose are widely distributed throughout Alaska. The following overview offers details according to various regions in the state. Southeast Alaska: Moose are found only in limited areas of Southeast Alaska, and are essentially absent from the major Southeast islands. Moose are relatively recent arrivals to some areas of Southeast Alaska. Most of the moose in the Southern Southeast Alaska mainland are localized in the Unuk River drainage. Good habitat is limited and moose numbers are low. These moose (as well as the moose in Unit 1B to the north) are believed to be the subspecies Alces alces andersonii, as opposed to Alces alces gigas, the largest of the moose subspecies, which is found throughout the rest of Alaska north of the Stikine River. These animals likely emigrated down the Unuk River valley (and the Stikine River valley in 1B) from Canada. Moose are occasionally reported in other parts of the area, and can apparently to swim the six miles across Clarence Strait to Prince of Wales , but there is no open season for moose in this unit. Southeast Alaska mainland, Cape Fanshaw to Lemesurier Point (GMU 1B): Isolated populations of moose in this area are believed to have migrated down the Stikine River and through the coast Range from British Columbia in the early 1900s, and are relatively recent colonists. Moose are found in the Stikine River Valley and near Thomas Bay, and a few other areas. Aerial surveys in 2004 counted 134 moose in the Stikine area. Southeast Alaska mainland, Berners Bay, and Gustavus forelands (1C) :Berners Bay: In 1958, 15 calves from the Anchorage area were released in Berners Bay, and a supplemental release of six more calves occurred in 1960. The goal is to maintain a post-hunting survey count of 80 to 90 moose. The population estimate was 100 in 2005 and down to 75 in 2006, mortality due to harsh winter. Gustavus Forelands: Moose colonized the Gustavus area in the 1960s, probably by moving down the Chilkat Peninsula from the Haines area. This has provided an opportunity to study moose and their impact on habitat as the population has grown. Managers and researchers continue to gather data associated with pregnancy, twinning, rump fat, and body condition – and habitat – to guide the management strategy. Population estimate was 329 (2006), and harvest averages about 42/year. Prince William Sound and North Gulf Coast (GMU 6) The majority of moose in Unit 6 originated from transplants of calves from the Kenai Peninsula, Anchorage, and the Matanuska-Susitna area. In the 1950s, Cordova residents raised 24 moose calves and released them on the western Copper River Delta. This population grew to a high of about 1,600 in 1988, then declined to about 1,200 as part of a planned reduction. The only moose endemic to this area are a small population of about 40 animals in the Lowe River Drainage and Kings Bay. 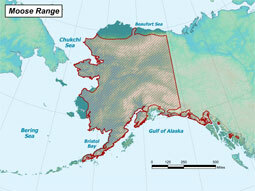 Western Kenai Peninsula (GMU 15): Kenai populations are affected by severe winters. The population estimate is 15A: 2,068 (in 2001) with a harvest of about 130 moose/year; 15B: 958 (2001) with a harvest of about 40 moose/year; 15C: 2,981 (2001) with a harvest of about 214 moose/year. Annual roadkill is high, about 98 in 15A, 59 in 15B, and 86 in 15C. Alaska Peninsula (GMU 9) Population estimates are 9E Central: 1,148 (1983); in 9E: 2,500; in 9C (outside Katmai National Park): 800; in 9B: 2,000; in 9A: 300; in 9D: 600 moose. The unitwide harvest is about 165/year since 2000 and the population is stable. Chitina Valley and the eastern half of the Copper River Basin (GMU 11): Population estimate is about 2,600. The harvest was 40 bulls in 2006-07 season. Upper Tanana and White River drainages (GMU 12): This is an area where intensive management is taking place, and the goals specific to this are to maintain a population of 4,000 to 6,000 moose, and a harvest of 250–450 moose annually. The population estimate was 3,600 to 6,400 in 2003, the harvest was 138 in 2005, 118 bulls in 2006, and 123 moose were taken in 2007. Predation by wolves and grizzly bears is a source of mortality, and Unit 12 is important for high levels of human consumptive use under the Intensive Management law. Managers would like to design management of potlatch moose harvest that better protects the moose population while meeting the villages’ needs. Matanuska Valley (GMU 14A): The population estimate is about 6,564 (2003).The harvest has been 376 /year (five year average). Non-harvest mortality is high in this area, and about 185 moose/year are killed by vehicles and 16 moose/year killed by trains (10 year average). The Pt. MacKenzie winter population exceeds 10 moose/mi2, one of the highest densities in the state. West side Susitna River (GMU 16A): This population has fluctuated greatly. Severe winters and predation are factors, and this is an area where intensive management is taking place. The population estimate is about 1,619, (2005) a 55 percent decrease since 1997. Hunter harvest has averaged about 150/year, and about 15 moose/year are killed by cars. In 2007 in 16A, 78 moose were harvested. West Side of Cook Inlet and Kalgin Island (16B): Biologists believe moose numbers probably exceeded 10,000 in Unit 16B during the early 1980s. Numbers declined about 20 percent after the severe winter of 1989-90, and numbers continued to decline, largely due to severe winters and increasing predation by bears and growing numbers of wolves. This is an intensive management area. The Kalgin Island moose population resulted from a transplant of calves during 1957–59. The population estimate for Kalgin Island was estimated to be 100 to120 moose in 2006. Managers look at Unit 16B as three sections, and the estimated populations are: 16B middle about 1,714 (2005), 16B north about 898 (2003), and 16B south: 960 (2004), for a total of about 3,570. The average annual harvest for all areas totals about 240/year (five year average 2000-2005). In 2007, 108 moose were harvested in 16B. Northern Bristol Bay (GMU 17): In the last three decades moose populations throughout Unit 17 have increased substantially in number and range as a result of moderate snowfalls in several successive winters, and decreased human harvest of female moose. The area is managed as three subunits and the population estimates are: 17A: 1,100 moose and increasing (2008), 17B: about 2,800 to 3,500, stable to decreasing (2006), and 17C: about 2,900 to 3,600, stable to increasing (2008). Yukon-Kuskokwim Delta (GMU 18): The lower Yukon River moose population is estimated to be 2,500 to 3,500 moose; the lower Kuskokwim River moose population is estimated to be 75 to 250 moose. The population estimate for the Paimiut area (just north of Hooper Bay) is: 994 ± 19.7 percent. Although much of Unit 18 is lowland tundra unsuitable as moose winter habitat, moose could be present in higher numbers because areas of riparian habitat remain unoccupied and in most areas where moose are present, their numbers are lower than the habitat could support. The illegal harvest, particularly of cows and particularly within the Kuskokwim River drainage, has decreased dramatically during this reporting period. Kuskokwim River drainages upstream from Lower Kalskag (19A, 19B, 19C, and 19D): Intensive management is taking place in 19A and 19D, and the Area around McGrath has been an area of particular scrutiny. This area has seen predator numbers reduced (wolves and bears) and an increase in moose numbers. The moose population around McGrath was estimated at 524 in 2001, and 691 in 2006, and 874 in 2008. The management objectives are: 19A and 19B: Achieve a moose population of 13,500 to 16,500 moose (7,600 to 9,300 in Unit 19A) with a harvest of 750 to 950. 19D: Achieve a moose population of 6,000 to 8,000 moose with a harvest of 400 to 600 moose in Unit 19D East and a moose population of 4,000–6,000 with a harvest of 250–600 in the remainder of Unit 19D.The population estimates are 19A: 0.44 observable moose/mi2 ± 28 percent (2008). For the 19D East: 5,280. Fairbanks area - Tanana Flats, Central Alaska Range (GMU 20A): About 30 percent of the entire Alaska moose harvest takes place around Fairbanks in three subunits of Game Management Unit 20, GMUs 20A, 20B and 20D. In the 1970s, moose numbers in the area immediately south of Fairbanks were a fraction of what they are today. The population in 20A dropped from about 23,000 in 1970 to just 2,800 in 1975. A series of severe winters, increased predation, and an ill-timed liberal harvest contributed to the steep decline. The population in 20A is now estimated to be about 16,000 animals, and the population objective (before hunting season) is 10,000 to 12,000 animals. The recovery of this population highlights the combination of factors that work together to benefit moose. There are concerns about the population exceeding the habitat capability and being vulnerable to severe weather patterns. The moose are showing signs of nutritional stress, and biologists are working to address the causes. Fairbanks area - Drainages into the north bank of the Tanana River between Delta Creek and Manley Hot Springs (GMU 20B): The population was estimated to be 16,000 moose in 2004. The five year average harvest (2000-2005) was 646/year. This is an Intensive Management area, with a population objective of 12,000 to 15,000 moose. These goals have been met or exceeded in 2003, 2004 and 2006. The population has increased from an estimated 9,800 in 1990 to about 16,000 in 2004. In 2007, harvest was 762 moose in 20B. West of Nenana River, south of Tanana River (GMU 20C), Denali National Park, north of Tanana River (GMU 20F), and south of the Yukon River upstream from Circle GMU 25C): Moose populations in these areas are at low densities. The population estimate in 25C: 0.46 moose/mi2 in 20C: 3,500 to 4,500 (1991); in 20F: 1,000 to 2,000 (1990). Central Tanana Valley near Delta Junction (GMU 20D): Intensive management is taking place in this area. 20D is divided into four subunits for management purposes, and the north and south portions of the unit are very different in terms of habitat, predators, moose density and hunter access. The management goals are to increase the fall moose population to 8,000 to 10,000 moose with an annual reported sustainable harvest of 500 to 700 moose per year. The population estimate for the south portion of the area is 7,243 (2006); SW: 5,926 (2007) SE: 690; and N: 2,411. A relatively high proportion of southwest Unit 20D has been disturbed since the late 1970s by land clearing and wildland fire, which combined with relatively low predation rates contributed to the current high density moose population. Charley, Fortymile, and Ladue River drainages (GMU 20E): Intensive management is taking place in this area. The annual harvest averages about 122 moose. Unitwide harvest of 137 and 130 moose during RY05 and RY06 respectively, was well below the intensive management objective. The harvest in 2007 was 144 moose.No effects from the nonlethal program were apparent on the moose population in Unit 20E during RY03–RY06, presumably because grizzly bears were the major predator on moose, particularly calves, in this area. In 2004 and 2005, more than 1,600 square miles of Unit 20E burned in wildland fires, and this should improve moose habitat. Innoko River up /including Iditarod River & Nowitna River (GMU 21A) and Yukon River - Paimiut up to Blackburn Cr. - and Innoko River down from the Iditarod River (GMU 21E) The population estimate for 21A: 4,300 to 6,480; for 21E: 7,000 to 9,000. The total harvest was estimated at 135-145 in the 2006-07 season. 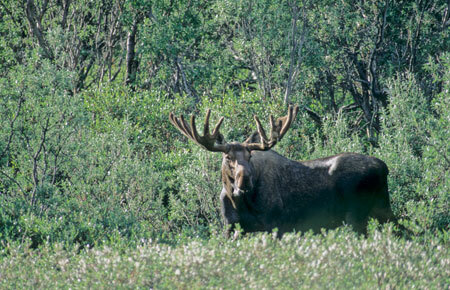 The Yukon-Innoko Moose Management Plan suggests the non-reporting rate is 50 percent in Unit 21E. Nowitna River drainage east of Poorman Road, Yukon River drainage between Melozitna and Tozitna Rivers (21B ): The population estimate is 4,049 ± 1,600. There seems to be a near stable trend in total moose numbers from 2003 to 2007. Yukon River from Blackburn to Ruby and Koyukuk River drainage below Dulbi Slough 21D: The population estimate is 8,342 ± 1,000. Seward Peninsula and the adjacent mainland drained by all streams flowing into Norton Sound (GMU 22): Local residents first reported seeing moose in the 1930s. The moose population increased over the years and reached a maximum size of 7,000 — 10,000 moose during the mid to late 1980s. Subsequent declines due to predation, winter mortality, reduced productivity and recruitment reduced the population to an estimated 4,500 to 6,500 animals. The population estimate in 2005 was 8,340 moose, plus or minus 1,000. The harvest in the 2004-05 season was 192. Compliance with regulations and harvest reporting is thought to be reasonably high in the Nome area and has improved as a result of education efforts associated with the new registration hunts. Western Brooks Range and Kotzebue Sound (GMU 23): The population estimate is that there are at least 0.1–0.6 adult moose/mi2. The reported harvest has averaged 174 moose/year for the five year average (200-2005), with an additional 412 moose/year harvested by Unit 23 villagers (from community harvest estimates). Koyukuk River drainage above Dulbi River (GMU 24): The population estimate is 8,467 ±1,460. The reported hunter harvest in 2005-06 was 162, with an additional harvest of 100 moose unreported. Hunting activity was typically concentrated in areas accessible by boat, with the potential for creating conflicts between local subsistence hunters and nonlocal hunters. Upper Yukon River Valley (GMU 25A, 25B, and 25D): In 2002 the Yukon Flats Cooperative Moose Management Plan was developed by Fish and Game, area residents and other local stakeholders, with the goals of increasing the moose population, improving hunt reporting, reducing cow moose take, and educating hunters in ways to help increase moose. The management objectives are to double the size of the moose population in key hunting areas and, if possible, within the entire planning area, in the next 10 years. A secondary objective is to increase the number of moose in Unit 25D from 4,000 moose to 8,000 by 2012. The population estimate in 25D: 3,100–5,200. Population surveys in 25A indicate moose numbers declined throughout the 1990s. Western North Slope of the Brooks Range 26(A): Population assessments indicate that moose numbers increased in the area between the early 1970s (about 1,220) and the early 1990s (to about 1,535); then declined to about 760 in 1995 and to about 325 in 1999. The decline appeared to be a combination of malnourishment, disease, mineral deficiency, predation, weather, and competition with hares (relative newcomers to the area). 50 moose were captured, examined and radiocollared in 1996-97, providing insights. The population began increasing in the late 1990s and the count was 576 moose in 2002 and 1,058 in 2005 (this includes moose counted on the border of 26B). Reasons for the increase may include improved browse conditions, reduced predation, favorable weather and reduced disease prevalence. North Slope of the Brooks Range and Arctic Coastal Plain east of the Itkillik River (26B and 26C): This area represents the northern limit of the range of moose in North America. Habitat severely limits the potential size of moose populations, and the concentrated nature of moose distribution and open habitat creates the potential for excessive harvests in accessible areas. The moose population in this area declined in the early 1990s probably due to a combination of factors including disease, weather, predation and possibly insects. The population began increasing in parts of the area in 2003. The estimate is 500-600 moose in 26B, and at least 200 in 26C. There has been no open season for moose 1996-2006 in this area. Generally associated with northern forests; found in Alaska from the Unuk River in Southeast to the Colville River on the Arctic Slope. Herbivorous, eating willow, birch, and aspen leaves and twigs, along with sedges, Equisetum, pond weeds, and grasses.